The holiday season can be a time of pumpkin spice, rosy cheeks, and light-hearted spirits. But for people in recovery, the stress associated with the holidays can be trigger inducing. A trigger in reference to addiction refers to any person, place, thought, or event that incites a memory or flashback surrounding the use of a substance. Substances are often used as a method of coping. According to a Psychology Today article, the reason stress is often amplified for people in recovery is that the same stressors others deal with during this time—such as family, financial, or relationship issues—are often intertwined with the root causes that lead a person to developing a substance use disorder. Depending on how long a person has been in recovery, dealing with the holidays can be even more amplified. For instance, if a person is newly recovered, he or she may not have had a chance to confront underlying family issues. In this case, having to be around many family members can be extremely overwhelming. On the other hand, it can be hard to navigate what events are “safe” to go to and which ones to avoid. For example, while one may think they can be around alcohol unbothered, being in the situation can erupt unknown desires. How long have you been in recovery? While it may seem that you are at higher risk as a newbie, being more settled into recovery can be equally as dangerous. The longer you’ve been in recovery, the more likely you are to get complacent. Remind yourself why you are sober. Make sure you are routinely practicing self-care. This is a time that you should be as strong as ever in your recovery plan. Go to meetings. Meditate. Don’t be quick to accept an invitation. What are the details of the event you’re going to? Don’t be afraid to ask what the event is really all about. Going without knowing could lead you to a bad situation that could ultimately threaten your recovery. No party or event is worth throwing away the hard work and accomplishments you’ve achieved. 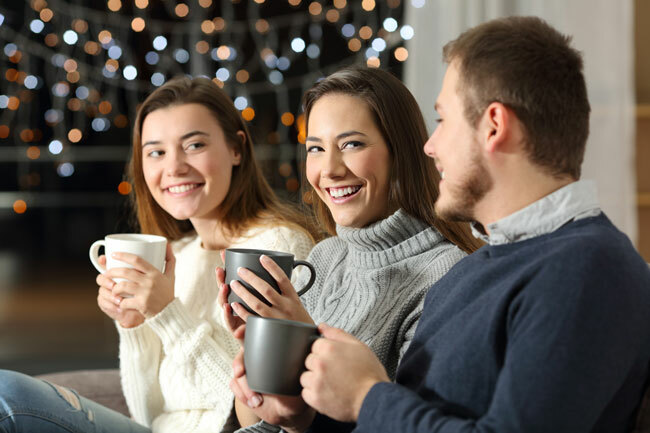 If you are at a holiday party with family, and you are suddenly confronted with an emotionally charged situation or trigger, take a deep breath. Try not to react. If you are able, find a way to leave immediately. You might feel guilty for leaving, but don’t. Holidays are emotionally intense for many people. The best plan is an evacuation plan rather than trying to figure out how to put out the flames. You might be told that a party will be alcohol free, but find a different situation upon showing up. Prepare beforehand for this happening. If alcohol is a trigger for you, you don’t want to spend unnecessary time around it. Make sure you have a ride secured to go home. Don’t commit to giving others a ride home. In this case, that could mean that you have to stay longer than intended. There are other people and other rides. Your number one priority should be your sobriety. In the event that you decide to go to a party where there will be alcohol served, try to bring a sober friend. Having support with you decreases the likelihood that you will give into a craving. Make sure that you aren’t fooling yourself. What is the real reason you want to go to the party? What role does alcohol play? Is it the main event? Or just a glass of wine to toast with dinner? These specificities matter. Rather than going to a party where the terms are uncertain, throw your own party. Make sure everyone knows it’s a sober party. Give it a theme and make it fun. Instead of BYOB, have everyone bring a special dish. It’s easy to get swept away with holiday emotions and remember that time you and a friend had a sweet time decorating the house. But if that is the same friend you used to use with, there is a good chance you are only fooling yourself. Do not return to old haunts. You are only asking for trouble. Every time you face an emotional trigger and do not let it defeat you, you gain power over it. One of the best ways to face emotional triggers is to allow the moment to pass. Undoubtedly, you are going to face triggers. Research shows, however, that given about 10 minutes, a craving will lose its power. Often things that cause a craving are bound by emotion. Part of embracing a craving or a trigger is to allow yourself to let go emotionally. We crave because we feel incomplete. Working on healing your mind, body, and spirit will give you the strength you need to stay on the right path. For more information about programs offered at Valley Recovery Center, including our intensive outpatient program in Sacramento, please call us today at (888) 989-9690.